The Lost Coast trail is the premier coastal backpacking trail in California and because of its significance has been designated a National Recreation Trail. The experience of hiking where the land meets the sea is unforgettable and strenuous. This is the California Coastal Trail at its finest! On the north section of the Lost Coast Trail you will mainly be walking on boulders, pebbles, and sand. This is in the Bureau of Land Management (BLM) King Range National Conservation Area. The south section is in California’s Sinkyone Wilderness State Park. Here you will hike 12,000 feet of altitude difference – more than in and out of the Grand Canyon! There is a 4 mile section of road in the Shelter Cove area that separates the north and south sections of the Lost Coast trail. I suggest that you take Horse Mountain Creek Trail to King Peak Road, 0.2 miles on Shelter Cove Road to Chemise Mountain Road where you will find Hidden Valley Trailhead (or vise versa if traveling south to north). This will significantly reduce your time walking on Shelter Cove Road. The averages hiking distance is 8 miles per day and is plenty of distance for the average backpacker, given the challenges of the terrain. The Wilderness Press map provides information for both the King Range and the Sinkyone. However, if you only need a map for the King Range I highly suggest getting a BLM map from the office is Arcata or Whitethorn – this map is much more accurate. I’ve talked with dozens of people using the Wilderness Press map that have no idea where they are. I’m planning a trip with a friend for late July/early august. I’m not sure that we are ready for the 3 night trip. Is it possible to park at a trail head. hike to a campsite for one night and then hike back the way we came in? It seems reasonable… but everything I read talks about needing a shuttle. Is there a reason people seem to only be hiking in one direction (wind??)? Thanks for the help! It is very common to hike in and out from the same Trailhead and not doing a shuttle. The shuttle is for folks that want to hike entirely one direction and not backtrack. The wind is usually from the North during the summer – but not always. If I am going to do a round trip part way north, where in Shelter Cove can I park my car? There is parking at the Black Sands Beach Trailhead. If I were to do a round trip of part of the norhtern Lost Coast Trail, which would be more scenic and easier, starting from and returning to Mattole, Shelter Cove? Both offer a similar experience. 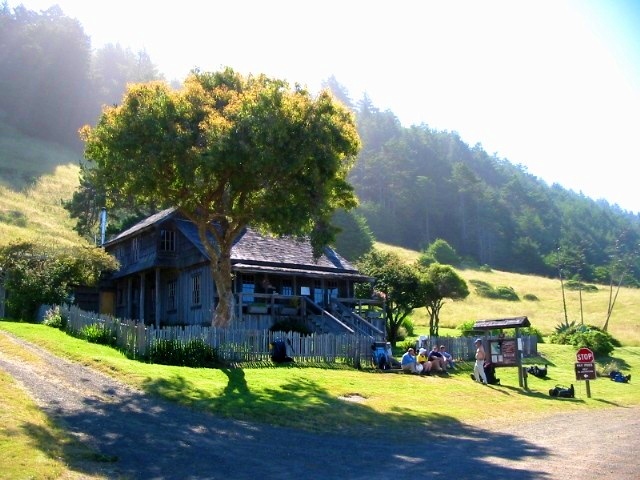 Starting from Mattole offers you the opportunity to visit the historic Punta Gorda Lighthouse. Hey there Lost Coast Ranger! My partner and I will be doing a 3 night backpacking trip, starting from one of the trailheads north of Shelter Cove, during July 4th weekend. Then we plan to pack up and drive to the Trinity Wilderness for some backpacking en route to Oregon. We’re aware of how to use a bear canister for when in the backcountry, but we haven’t done back to back trips like this one, which would involve storing food in our car for after our trip in the Lost Coast. We’re aware of Yosemite’s policy on storing food in cars overnight because of bears, but how can we do so safely in the Lost Coast. Are there food lockers at any particular trailhead(s)? Would keeping the food in airtight mason jars in the trunk be OK? Or would you recommend odor proof bags? Thank you! We do not have problems with bears breaking into vehicles in the King Range – You will be OK storing your food in your vehicle. I’ve heard there may be trail damage on the South portion of the LC. Some mention it may result in closing of the trail for the remainder of the summer. Have you heard of this? The Sinkyone Wilderness Lost Coast Trail is not passable. There is a big washout south of the Needle Rock Ranger Station and 1/3 of a mile north of Bear Harbor that is not safely passable. My partner and I just backpacked the southern portion of the LC. It was passable as of July 4th weekend. There are a couple areas of washout which people have added ropes to so that you can get over it. Definitely a couple of sketchy areas, but we were able to pass with only a few heart flutters. However, I personally did not find this hike worth it. Thought it was BEAUTIFUL I will say. The following is some information I wish I had known before embarking. One, if you are starting from Hidden Valley, one of the comments above it true – the **WILDERNESS PRESS MAP IS INACCURATE**. We came across several forks along that trail that did not exist on our map and ultimately had to turn back to our car as we had a feeling we were on the wrong one. It was in the evening, so we were running out of time. We drove to the Needle Rock Visitors Center to start there instead. We decided because of the time and the condition of the trail we had already observed to stay the night there. It was $25 to camp at the Needle Rock Visitors Center – quite high. The camp spot we got was on a slight slope and pretty bumpy, and there was an outhouse and water spigot. Far too much money to camp in an area that has few services and not even a pristine camp spot. Also, no trash service there. You also have to pay for each night you camp along the trail. $5 per person per night. Again, we were pretty upset about this cost considering the condition of the trail. I have no idea what they are using this money for, but I would really love to know the budget breakdown. I can only speculate. The last mile or so as you hike to Usal has just had maintenance done and it looks great. Of course, about 19 miles too short of maintenance LOL. But, to be fair, I have no idea how much time the maintenance of trails takes so if it’s in the works, that’s a good thing and is completely necessary. If we hear the maintenance has been done, we would love to try this hike again for a more pleasant journey. There are some outhouses along the trail at the various camp spots, so I’m sure there are maintenance costs for those as well. However, I did not use them due to the lack of cleanliness. I preferred finding a spot in the outdoors. If you also prefer to use the great outdoors for your business as well, please be considerate and make sure that your toilet paper is either buried or packed out – I saw a LOT of TP on the trail (gross!) after Bear Harbor. Seems a lot of people were using that as their poo spot if they were camping there. Don’t be that person – no one wants to see that. Issues of lack of maintenance you should be aware of: VERY overgrown plants along a large portion of the trail. I felt like I was in a safari movie wading through jungle plants, or at least, that was my theatrical side coming out. There are also large patches of poison oak in some sections that are difficult to avoid touching as well as very brushy areas that make for a very narrow trail and some bushwacking. (MUST wear pants. Seriously, you will want them. )The trail is very steep in large section and definitely needs more switchbacks, especially considering that along some of the turns of the [too few] switchbacks, there is some fallout that makes it difficult to get up the trail.The trail is also slanted horizontally. In other words, your left foot is higher than your right foot as you walk (hopefully that makes sense), which is killer on the ankles. There are other areas of fallout along the straight sections that have ropes to aid in crossing safely. In one fallout, they have an orange cone indicating to go up and around that spot (I am assuming that is the “impassable” part that the Sinkyone Wilderness site is referring to). That is one of the spots with ropes. There are a couple bridges that are passable but also in need of maintenance. Oh, and just fyi on our background, my partner is a relatively experienced backpacker, mountaineer, hunter, outdoorsman. I have a couple years of backpacking experience limited to 1-4 day trips. I can handle decently strenuous hikes, and 8 miles/day is usually my sweet spot, though we did 12 miles on our last day of this trip. I needed a couple rest days after this one – I was really sore due to the horizontally slanted trail and avoiding obstacles of the maintenance listed above. 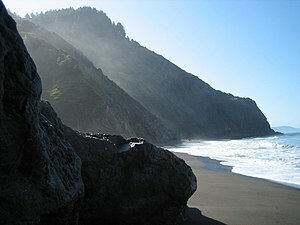 We are planning to do 2 nights starting at Shelter Cove/Black Sands Beach, and walking north. Are there good camp spots within a couple miles that are south of the area that is impassable at high tide? And if so, are they located by creeks/water sources. thanks! Click here to view a detailed trail map. Horse Mountain Creek and Gitchell Creek are good places to camp. Keep in mind that you can camp at the creeks that are within the “impassable at high tide” section. You just don’t want to be traveling through that zone on an incoming/high tide. Hi there! Four of us are heading to the Lost Coast Friday next week, and I just wanted to tell you how much help this site and your blog have been in helping us plan. For our third day, we are thinking about going as far as Shipman Creek, so we have a shorter and easier last day. Do you know if there is decent camping at Shipman? We realize it is in the intertidal zone and we’ll have to leave early to get out of there while the tide is still going out. I’d like to make sure it’s a good place to camp before we commit to staying in an area where we won’t be able to leave for half a day. Thank you for any input you can provide! Is there a car camp spot near black sands beach where we can crash if we have an early shuttle the next day? Wailaki, Nadelos and Tolkan Campgrounds. There is also a private campground in Shelter Cove. Overnight parking is not permitted at the Black Sands Beach Parking Lot. We plan to do a 4 day trip (Mattole to Shelter Cove) but won’t get to the Mattole trailhead until late afternoon on Thursday, August 11th. Say we start hiking after dinner at 6:25pm which is high tide (5.5ft) I see the first “high tide” obstacle is just 2 or so miles in at Punta Gorda. Looks like the tide gets to 3ft at 10:28pm. I was hoping to make it to the lighthouse on Thursday but maybe we should just stop right before this “high tide” obstacle. Looks like there will be a 1/2+ moon. Might be able to hike at night… not sure. If not, is there a camping spot just 2 miles in? There are a few small streams between Mattole TH and Punta Gorda that are decent places to camp. Keep your eyes peeled and you’ll find them. I don’t recommend doing the LCT in 2 days. I personally think you will find more enjoyment (and less likely to be injured) if you do an out and back trip. Hi Lost Coast Ranger, thanks for this blog! I’m considering doing the Northern section over 4 days this summer with my 2 kids (9 and 12). They are strong hikers and have done long distance (10-13 miles) day hikes in Glacier and Yosemite, but I am wondering if I am crazy to plan this. Do you ever see kids on the trail, or am I taking an undue risk with them? Thanks for your advice. I think a summer trip with kids on the Lost Coast Trail is a great idea and completely doable, considering that they are strong hikers. Hiking in the sand and rocks seems to be much more challenging than many people anticipate. Also, yes, I have seen kids on the trail. Have fun! We plan to hike the northern section of lost coast trail later this year. My husband and I both are highly allergic to poison oak, is there a way to avoid contact with this horrible plant?? After reading about how much there is we may change our minds about this hike, we were looking forward to. There are several sections with quite a lot of poison oak from Big Flat up to Mattole, and all of the upland trails, Basically. If you want to avoid the plant but still want to enjoy the area I recommend doing an out-and-back from Black Sands Beach, not going farther north than Shipman Creek.